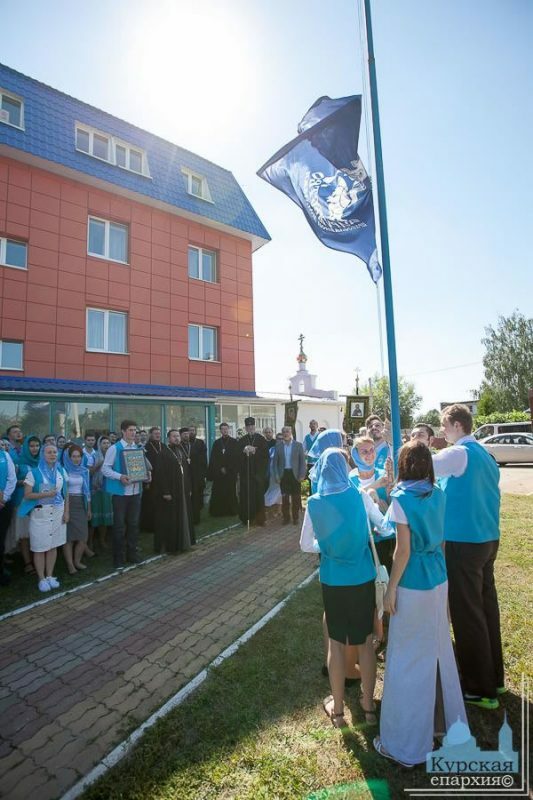 On Tuesday, July 19, 2016, the Korenny Pilgrim Center near the Kursk-Root Hermitage in Russia hosted the opening of the 9th International Concord of Orthodox Youth. The main focus of this conference will be the celebration of the 1000th anniversary of the Russian presence on Mt Athos, Greece. This is the ninth time that Kursk is hosting this event. This year, 85 representatives of Orthodox youth gathered from Australia, Germany, Great Britain, France, New Zealand, Poland, as well as from Ukraine and Belarus, and of course Russia, Tatarstan and Crimea, all to show their unity on the foundation of spiritual values. As is customary, the event began with a greeting from His Eminence Metropolitan German of Kursk and Rylsk, who warmly welcomed the participants and talked about the history and work of the diocese, and also emphasized the importance of such gatherings. The archpastor wished the youth success in this endeavor, and that they enjoy friendly, Christian engagement. 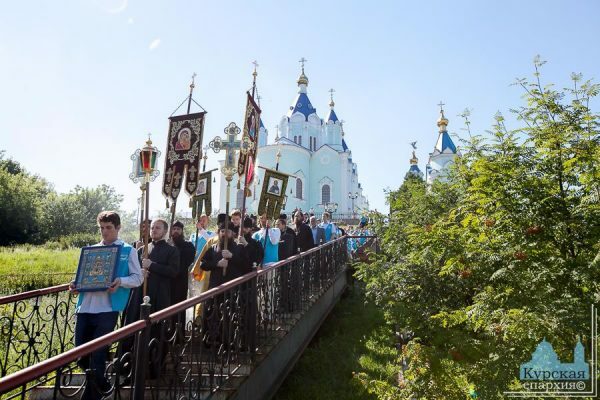 The raising of the flag of the conference then followed, with a procession of the cross with a copy of the Kursk Root Icon of the Mother of God “of the Sign” to Kursk Hermitage. The prior of the monastery, Abbot Serafim (Kotelnikov) met the youth at the monastery gates. At the Church of the Mother of God “Life-giving Wellspring,” Metropolitan German performed a moleben at the beginning of a good work. Then, Vladyka German told the young people about the monastery, which is closely bound to the renowned Kursk Icon, and then offered his archpastoral blessings. During the Kursk stage of the event, the youth will participate in the celebration of Divine Liturgy in the main churches of the city and Kursk-Root Hermitage, and will visit “Orthodox Kursk” exhibition, St Sergius-Kazan Cathedral and the Cathedral of the Mother of God “of the Sign” and Holy Trinity Convent. The excursion “Kursk: City of Military Glory” will include a visit to Kursk Duga and St George the Victory-Bearer Church. The event will include visits to the dioceses of Moscow, Rostov, Krasnodarsk, Crimea and Simferopol, where the youth will attend divine services at church and monasteries, monastic workshops; they will meet with clergymen, youth and social workers, hold round tables on spiritual matters, but also enjoy social events in the evenings. They will also visit the 7th “Concord of Orthodox Hearts” arts festival in Sevastopol. The main event of the gathering will be the celebration of the 1000th anniversary since the first Russian monks arrived in Holy Mount Athos, and the 75th anniversary of the beginning of the Great War of the Fatherland (WWII). The event will conclude with a formal ball for the participants.